So you all know Kristin from skirt as top, right? Well, she just welcomed her third babe into the world a couple of weeks ago and I wanted to send her and her littlest one some love. I was trying to think of the perfect handmade gift, but when I couldn’t decide what to make, Jessica of A Little Gray came up with the brilliant idea of a Noodlehead Divided Basket. Kristin has made a few of these for other people already, it’s kind of her go-to baby shower gift, so it just made sense for her to receive one too, right? But then I realized quickly that this was a great thing, because two divided baskets is certainly better than one! 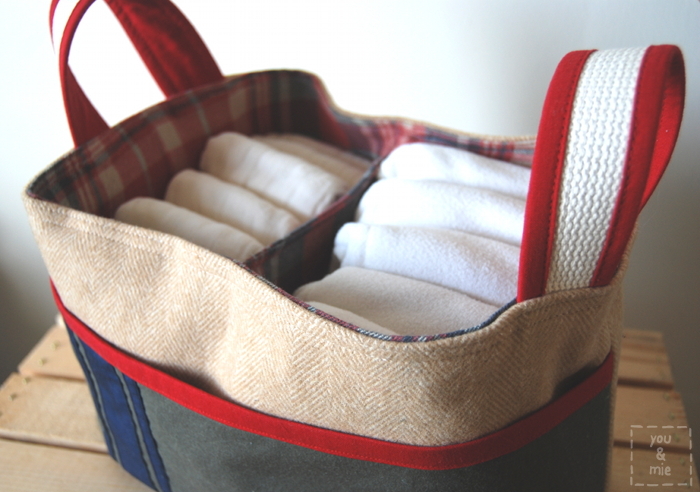 With all the things you can do with a divided basket, we might as well have made one for every room in the house. The theme for the boys’ room is Camp Ivanhoe from the movie, Moonrise Kingdom. I checked out Kristin’s pinterest board for some inspiration and picked this particular blanket to pull colors and style from. I grabbed all of the “campy” fabrics from my stash and it turns out, I have quite a lot! The main fabric is a wool remnant that I’d been holding on to for awhile and never quite knew what to use it for. BINGO. I think it worked perfectly here. The pocket and accent pieces are all solid quilting cottons. On the pocket, I made some strips of fabric to make stripes and top stitched them on. 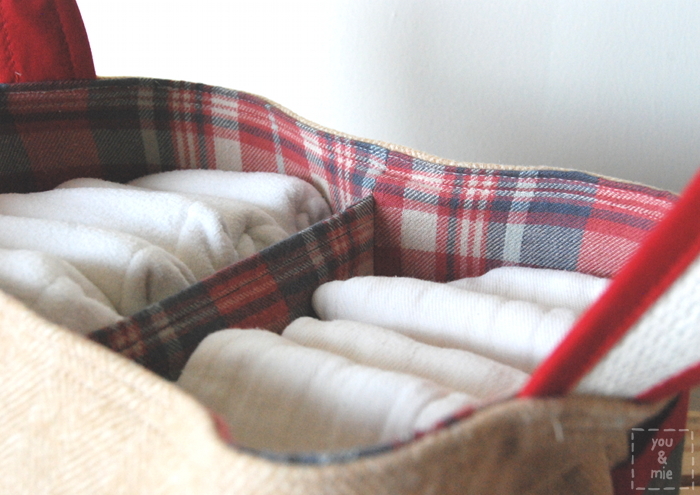 The lining of the basket is an awesome plaid flannel from Jo-Ann. The pattern is great. I’m thinking that Anna (aka Noodlehead) is a genius, because I couldn’t really imagine how this was all going to come together, but she figured it all out for us and it’s really kind of magical. This is the first time I’ve sewn one of her patterns and I’d say it’s a really great one to start with. I also really want to make a Super Tote and a Cargo Duffle, and well, pretty much all of her other patterns. In the directions, Anna recommends using fusible fleece to give the basket more structure, especially if you are using a lightweight material. Well, I thought that the wool was thick enough and didn’t use any, but I wish I had. The basket is pretty floppy and doesn’t really stand up on it’s own when it’s empty. But even without the fusible fleece, my machine had trouble stitching through the thicker sections (where the handles meet the body of the basket), so I’m not sure if it would have been able to handle another layer! So we’ll see. If I make this basket again (and I assume that I will), I definitely will use the fusible fleece and just hope my machine can handle it. 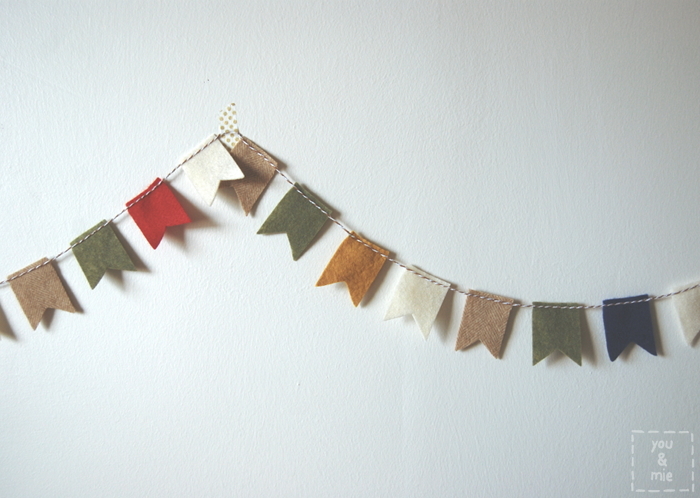 I also made a little flag garland for the room with craft felt and felted wool. I used the template for the scrap flag garland from this book (affiliate link), except I cut the top 1/2 inch off the top of the flags and carefully top stitched baker’s twine to connect them all. Then I filled the basket with a bunch of other goodies (not the diapers shown here) and shipped it off to meet its new little owner. I hope I get to meet him someday soon too! He seems to be fitting in so well with his awesome skirt as top family 🙂 Awwww . . . you really gotta check out those sweet newborn pictures. Is it crazy that I have baby fever already when I still have my own baby?? This entry was posted in sew & tell and tagged baby, baby gift, camp ivanhoe, divided basket by Cherie. Bookmark the permalink. I think you should go for it! It’s not a really complicated project, but it’s true that if you want to add some fun details, that can take time. But once you get those done, the basket itself comes together pretty quickly. I think I spent 2 days on it (working an hour or two each day, maybe?). I’m sure that some people can finish one in one sitting, but it just depends on how fast you work and how much time you have 🙂 Do it! It’s fun! 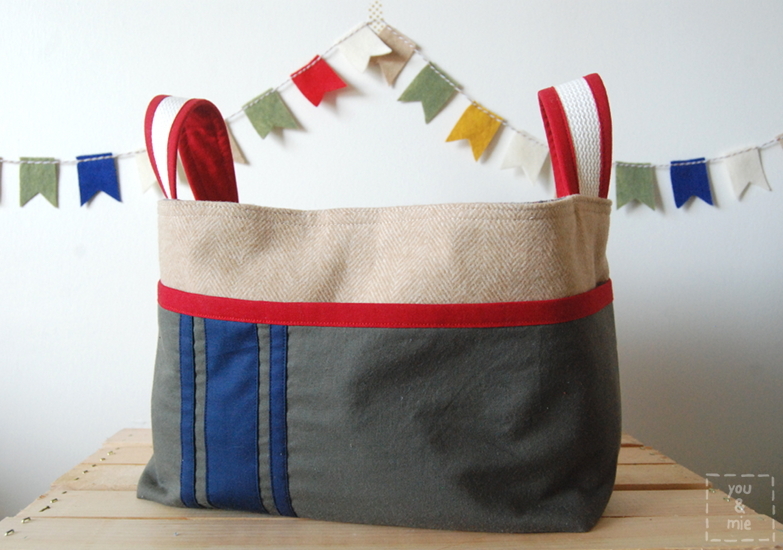 A perfect gift> I’ve just been over to the Noodlehead site and I want to make EVERYTHING!!!! Your basket is very cute! I just made this for a friend’s baby shower. When you add the fusible fleece, you cut away 1/2″ on all sides so it doesn’t end up in the seam allowance. Because it does get a little hard to sew at the end! Oh, that’s so smart!! I’m telling you, that Anna! Definitely going to try the fusible fleece next time. Thanks!! This is amazing! I love the color scheme! How gorgeous! I love it, wish I could sew! The felt garland is something I may be able to actually manage though, will have to try it out! The felt garland is a perfect project to start with! In the book, the flags are longer and you fold them over the string by 1/2 an inch and sew them down. I don’t necessarily recommend the way I did it, just because it’s a bit tedious trying to sew on string. Good luck! Your basket is so great! Love the colors and the binding on the handles. Gorgeous! I love the colors and the stripes. And I definitely agree that you can’t have too many baskets – I’m sure with a new baby, they’ll have a lot to put in them! Thanks! Yes, it’s crazy how much one tiny human being requires, isn’t it!? EEEEEEEP! This basket is perfect, really. It fits into the room like a dream – and you’re right, one can’t have too many divided baskets! Gail’s is currently in our room getting heavy use for late-night diaper changes, so it’ll be awesome having another that goes in the room now! Can’t wait to hang the garland and dress little C in his awesome Ivanhoe-inspired duds, too. So great. This is so cute and perfectly captures the camp theme. Thanks!! It was such a fun challenge working from a movie/theme as inspiration. ooo love it!! I may need to make these for all the new babies popping out around me! Ooh, yes. If you know more than one person having a baby, you should start a little divided basket factory. Seriously, once you get the hang of the first one, you can probably bust a few more out in no time! Every time I see one of these I think I must buy the pattern Yours is no exception. 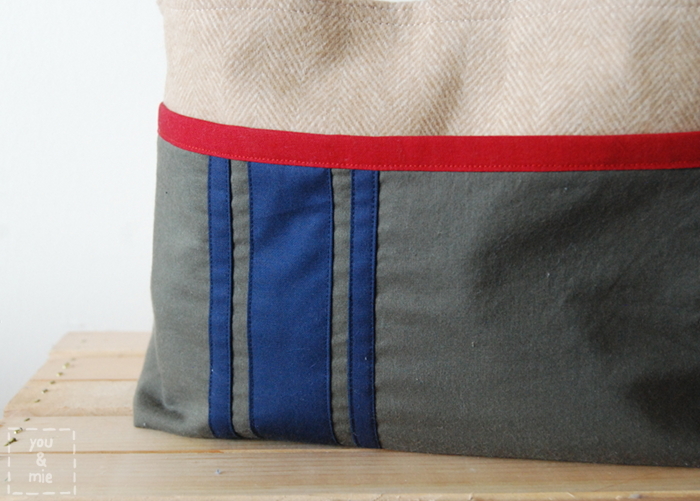 I love the colours of this one and your genius little sewn on stripes. Wow – that’s so cute, and what great colour combinations! I bet it was really gratefully received. ooh super cute!! Love the brilliant fabric combinations!! !